The “NO RULES Boondoggle” release is Saturday, March 26 at the Perrin Pub. 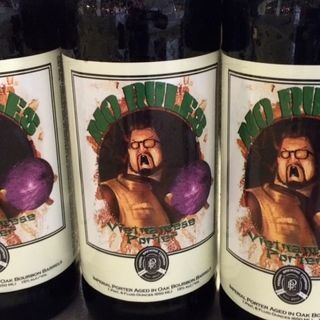 “NO RULES” will be released in 22oz bottles and on draft. Both bottle and draft selections will be offered to the public at Perrin Brewing, Saturday, March 26th starting at 11am. The beer will be available on draft ... Maggiori informazioni for 8oz pours throughout the day. Perrin Pub Club members will have the opportunity to purchase their bottles an hour early, starting at 10am Saturday morning. “NO RULES” will be available for $16.99 per bottle. There is a limited number of bottles being sold, sales are on a first come first serve basis. RateBeer.com named “NO RULES” The World’s Top New Beer Release of 2015, along with giving “NO RULES” a score of 100 for Style and 100 for the Overall categories, a perfect score. Draft Magazine Ranked “NO RULES” their #1 beer for Winter sipping. NO RULES the 15% Imperial Vietnamese Porter is brewed with coconut, cinnamon and turbinado sugar then laid down and aged in bourbon barrels. Distribution in stores for “NO RULES” is set for Monday, March 28th.